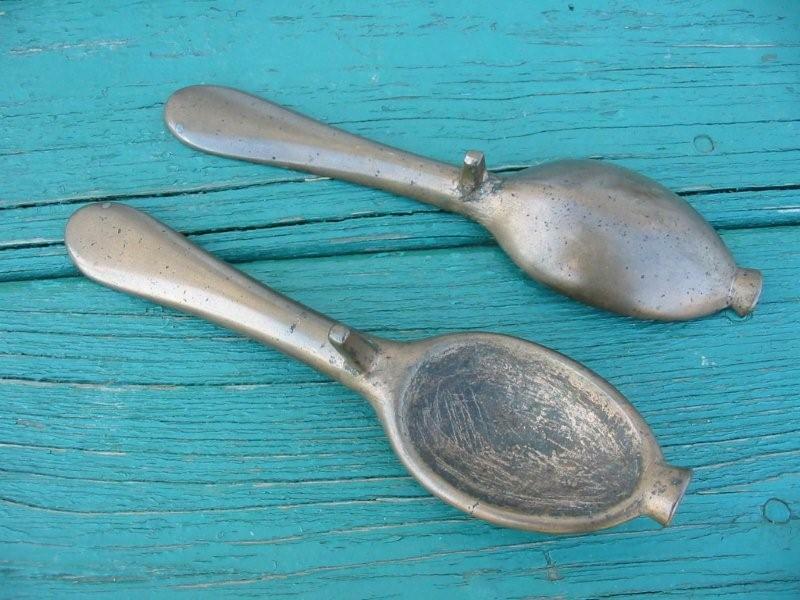 Cast from my original 18th century molds in safe, lead-free pewter, these spoons are identical to those used over 200 years ago. Ten styles to choose from. 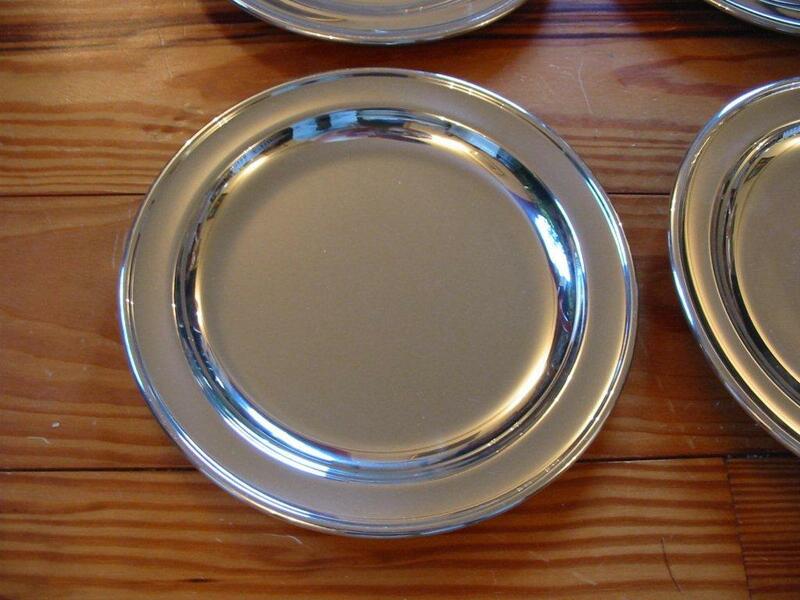 Available "as cast" finish with flashing trimmed and ready for you to polish or use as-is; or polished and ready to set the most elegant table. 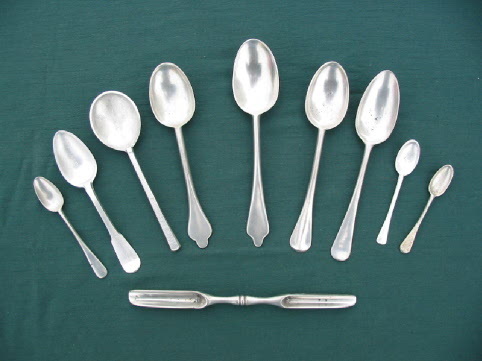 Pictured from left to right: Tea Spoon, Fiddleback Spoon, 17th Century Spoon, Queen Anne Spoon, Serving Spoon, Hannover Spoon, Double Drop Spoon, Tea Spoon 2, Salt Spoon. 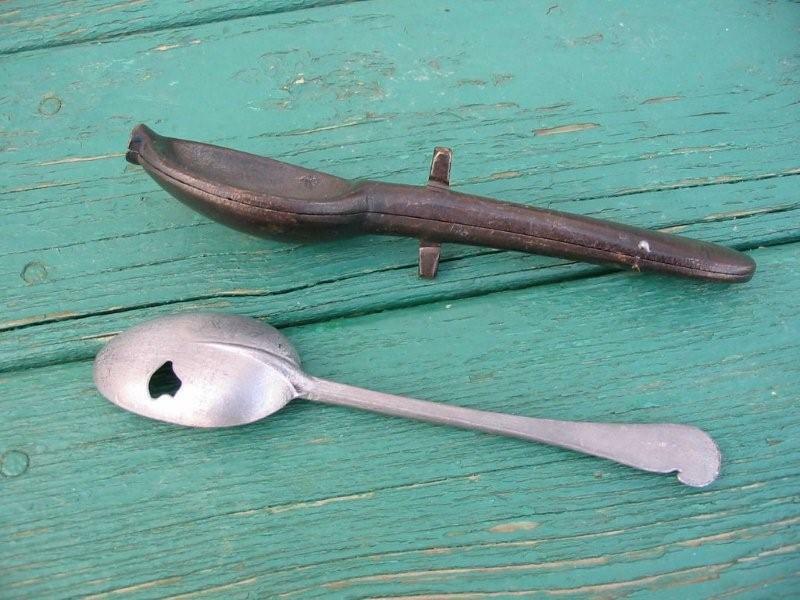 Bottom: Marrow Spoon. 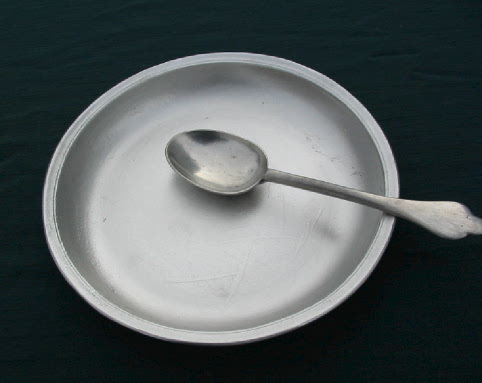 *Double Drop pattern - a longer bowl and narrow handle on this late 18th century spoon, with scallop design on bottom of the bowl. A unique pattern that differs from the masses. Measures 71/2 inches long. 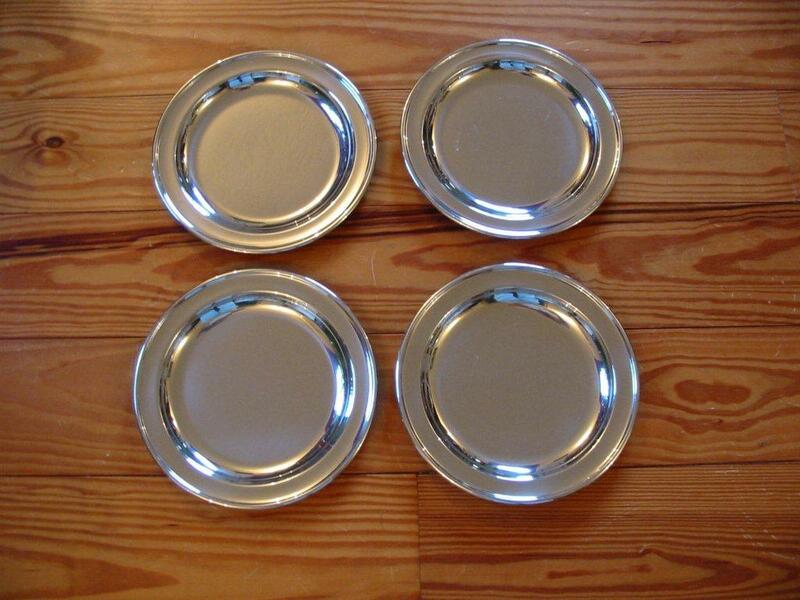 High Polished - $30, Satin Polished $20, As Cast - $10. *Hannover - mid-18th century pattern with rat-tail and raised center-spine handle. Measures 7 1/2 inches long. 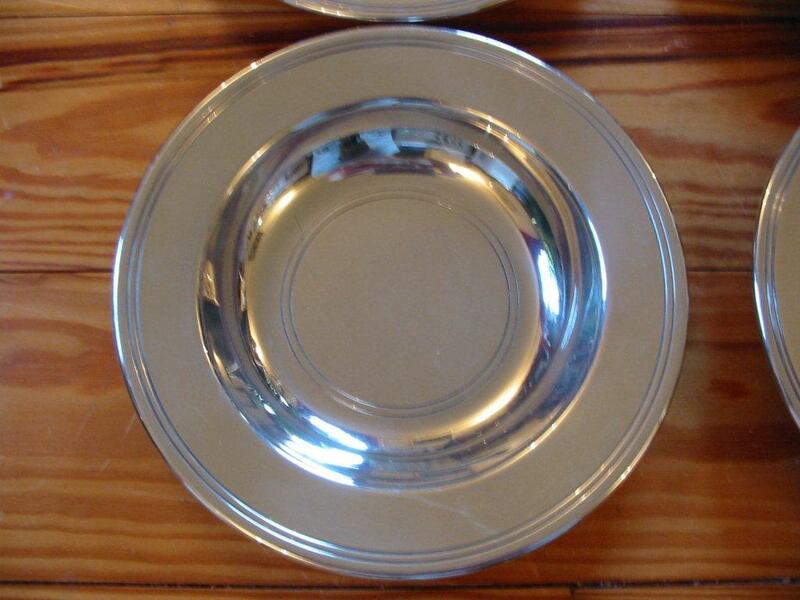 *Queen Anne pattern - classic early 18th century pattern with rat-tail under bowl and flared, scalloped handle. Measures 7 1/4 inches long. 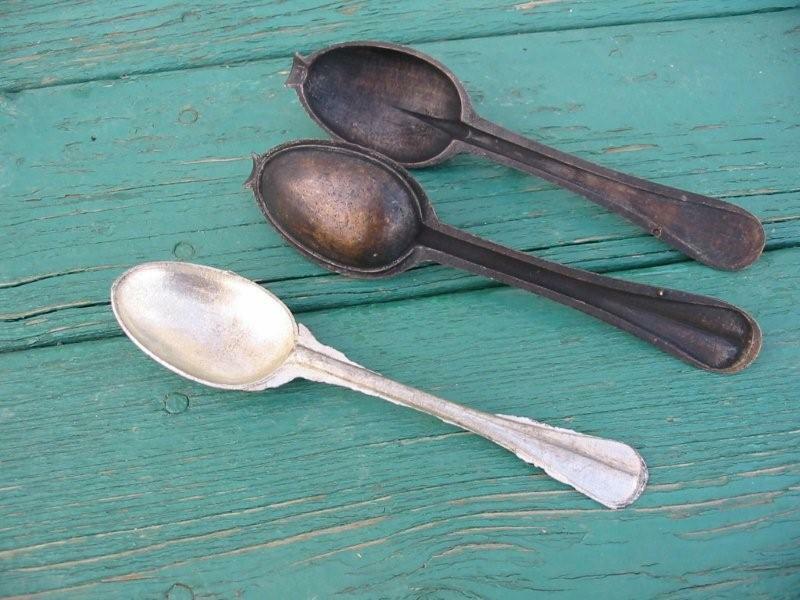 *Serving Spoon - Slightly larger version of our Queen Anne. 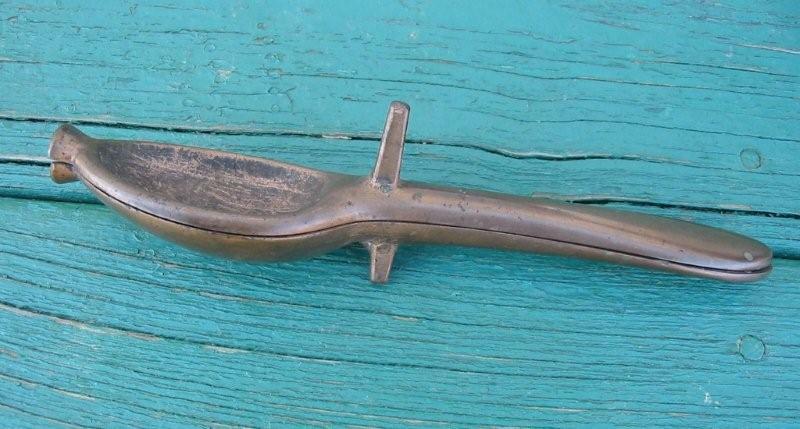 Measures 8 inches long. 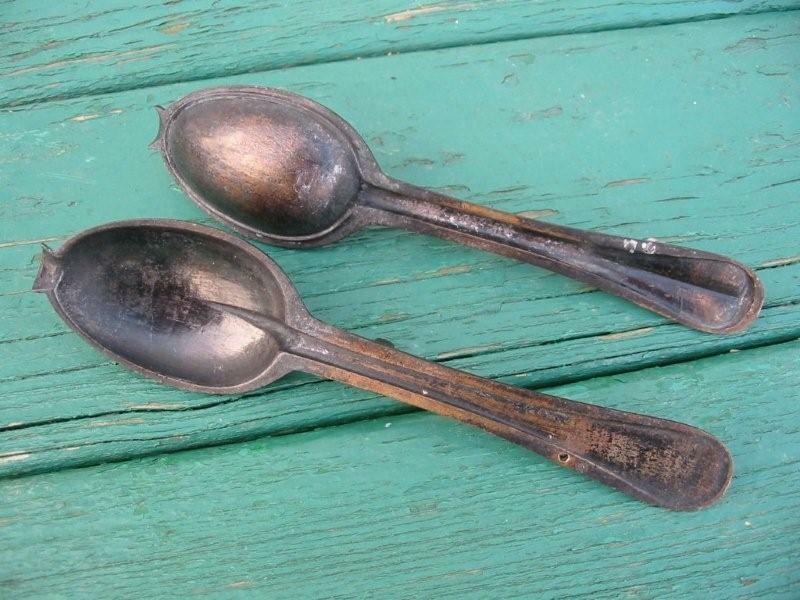 *Design Spoon - Approximately the same size as our other table spoons. 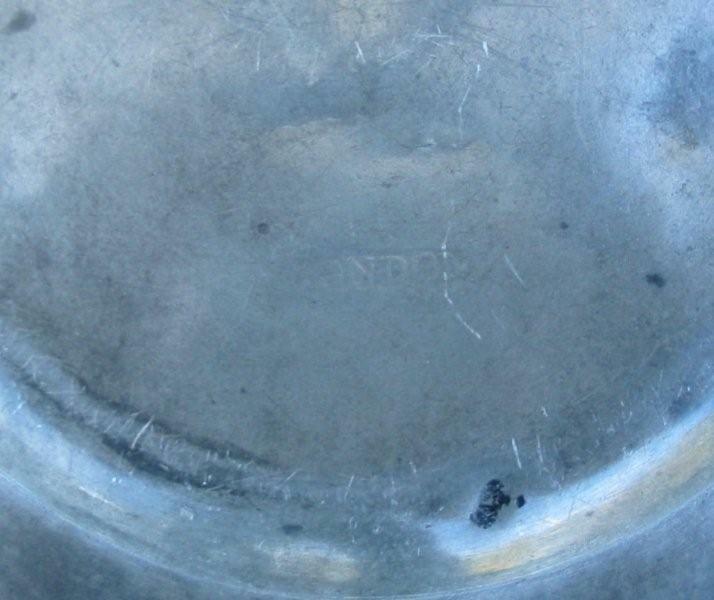 Late 18th-Early 19th century with rat-tail under bowl. The original mold this spoon is cast from is possibly American-made as it has a slightly more folksy appearance with it's primitive design work on the handle. 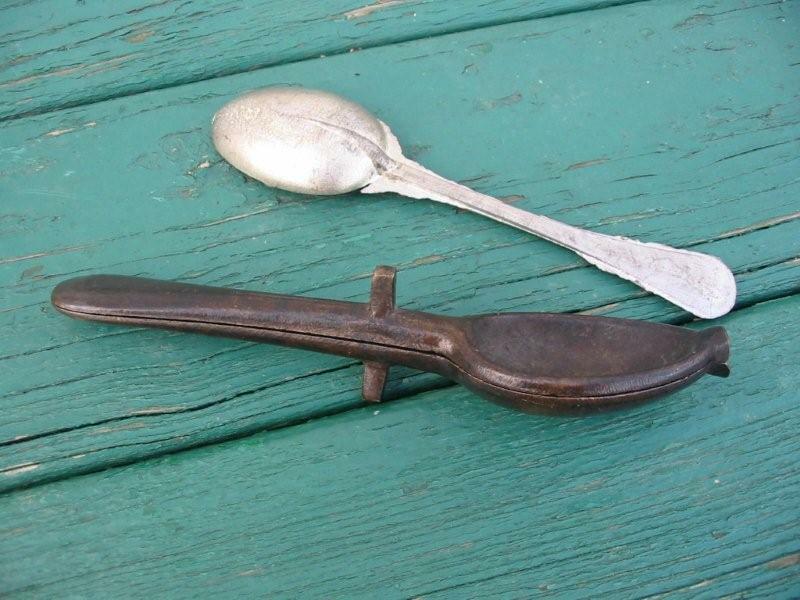 17th Century Table Spoon - earlier pattern with slightly rougher finish. 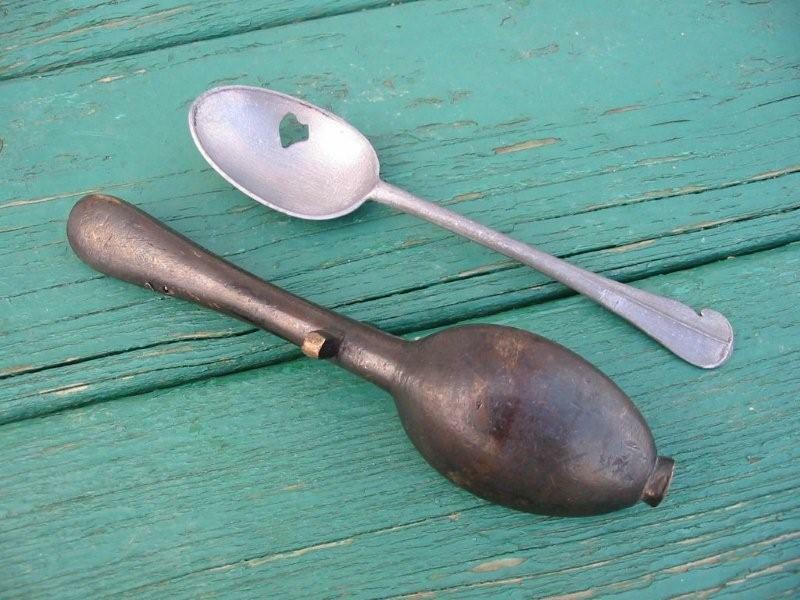 A heavy spoon. Measures 6 3/4 inches long. 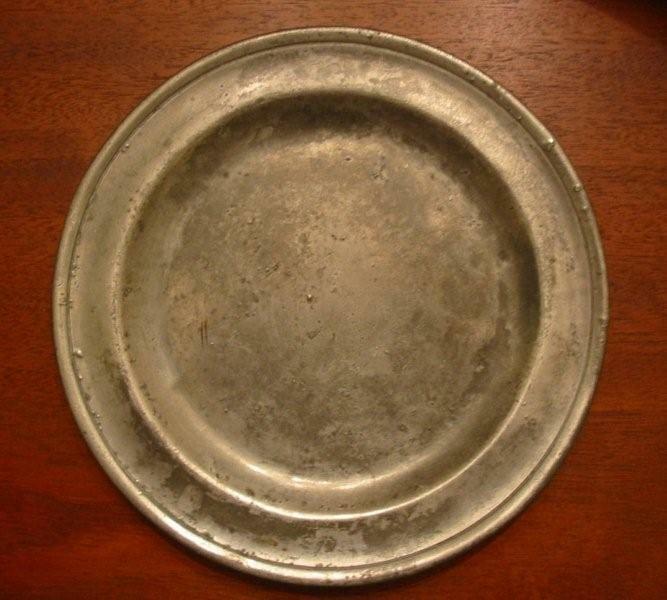 As cast - $10. 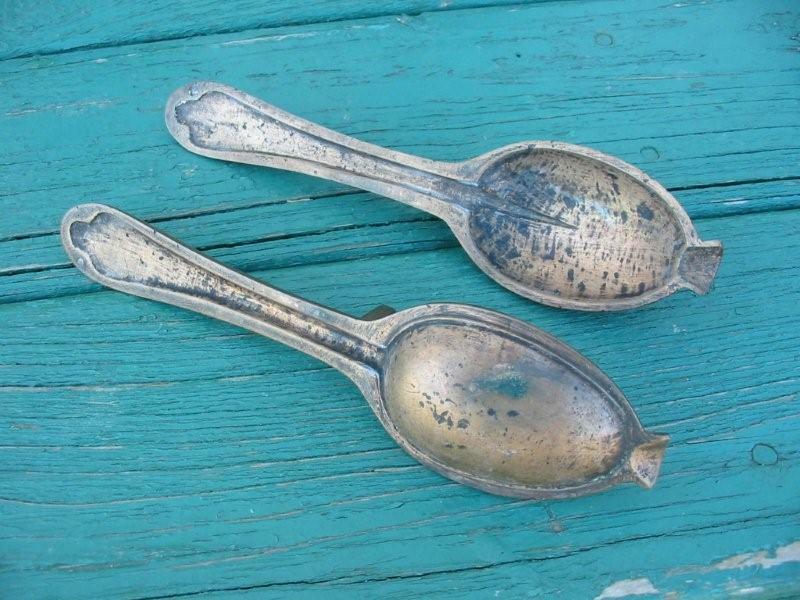 *Fiddle Pattern Spoon - Slightly smaller than our other table spoons, this pattern became popular in the 1780s and continued through the early 19th century. 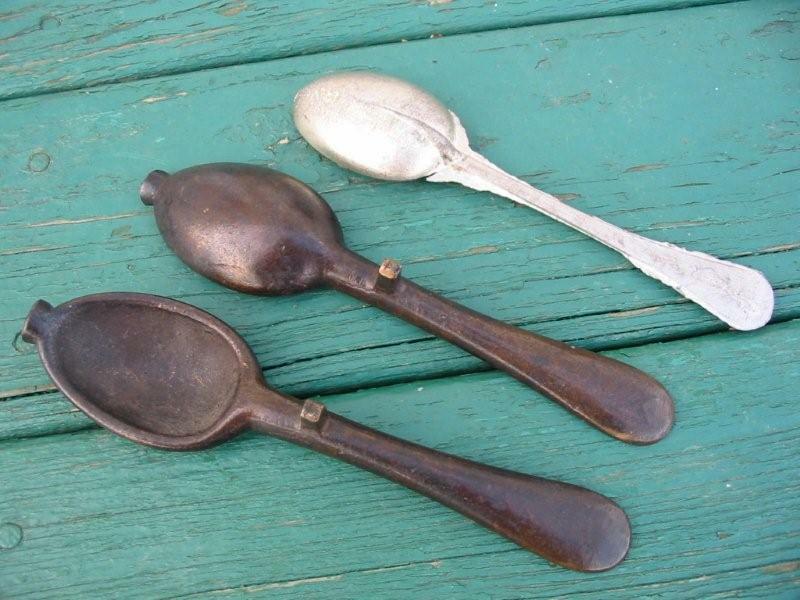 Marrow spoons - a long narrow spoon used to dine on that 18th century delicacy. 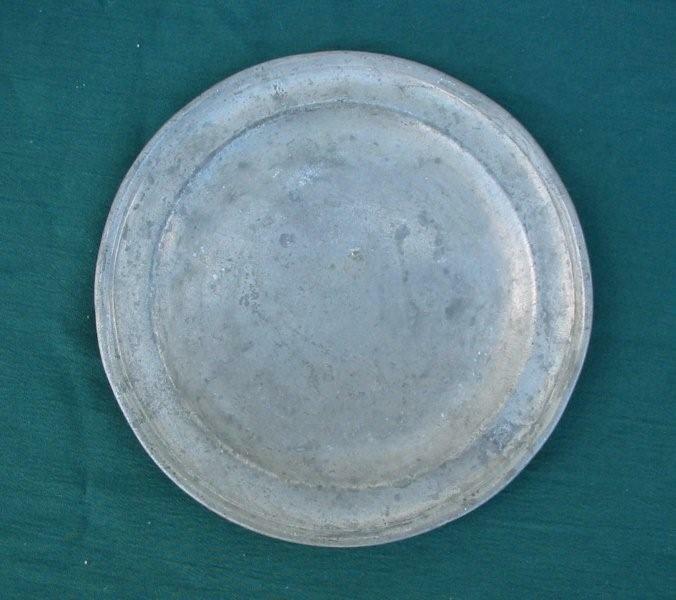 Measures 8 7/8 inches long. Polished - $50, as cast - $25. 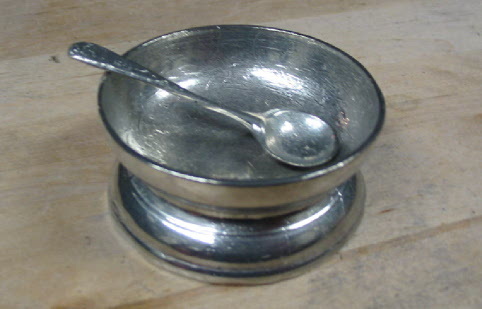 *Tea spoon Similar to the Double Drop pattern. 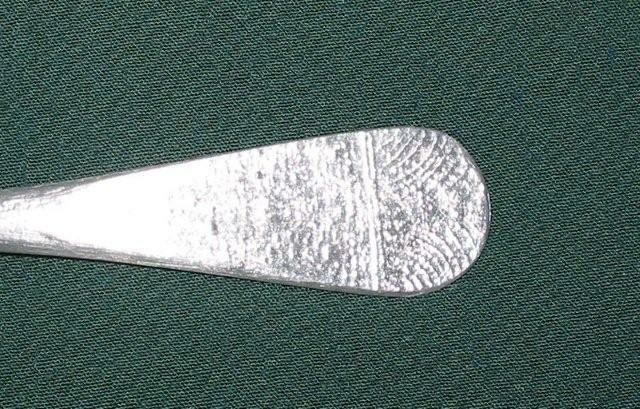 Measures 4 3/4 inches long. $20 polished, as cast $7. *Tea spoon 2 Similar to the Hannover pattern. Measures 4 1/4 inches long. $20 polished, as cast $7. 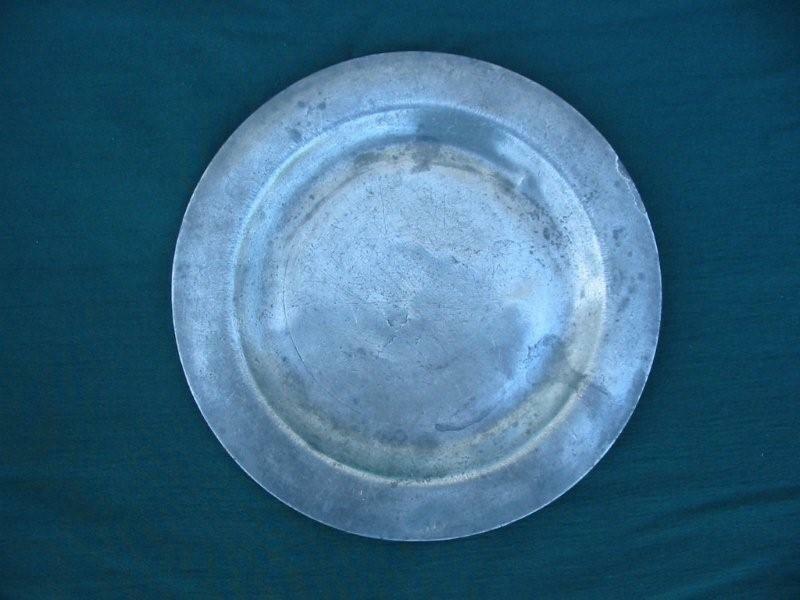 Pewter-look Plate Similar in appearance to the above plates, but cast from a hard, durable alloy. 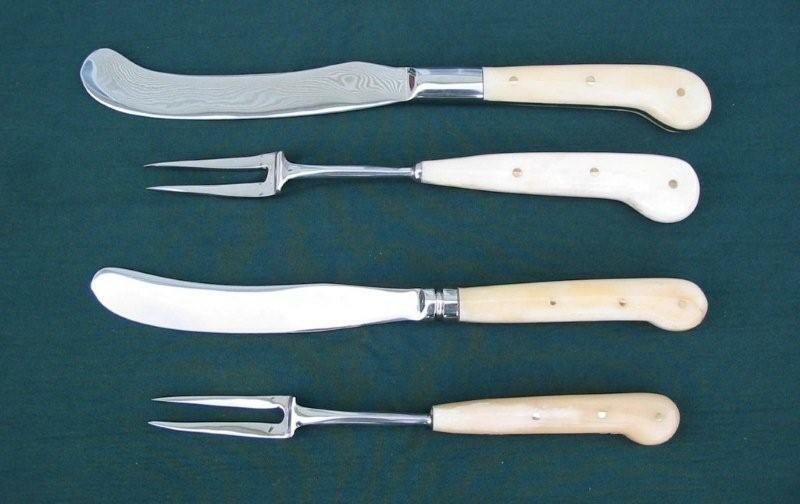 Pistol Grip Knife/Fork Sets with bone handle. In two sizes. $35 per set. 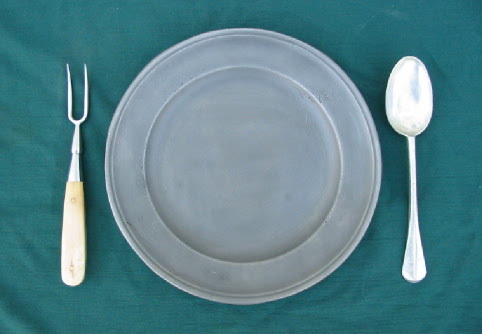 Knife/Fork Sets Traditional 18th century style knife and fork set with bone handle. $33 per set. 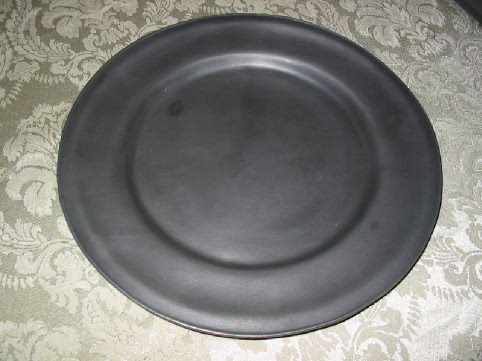 Made in Williamsburg Virginia at Shirley Pewter, these heavy, spun pewter plates with turned edges are in very good condition; some are like new, a few have utensil marks from being lightly used, but all have been taken care of very well and retain their high polish. 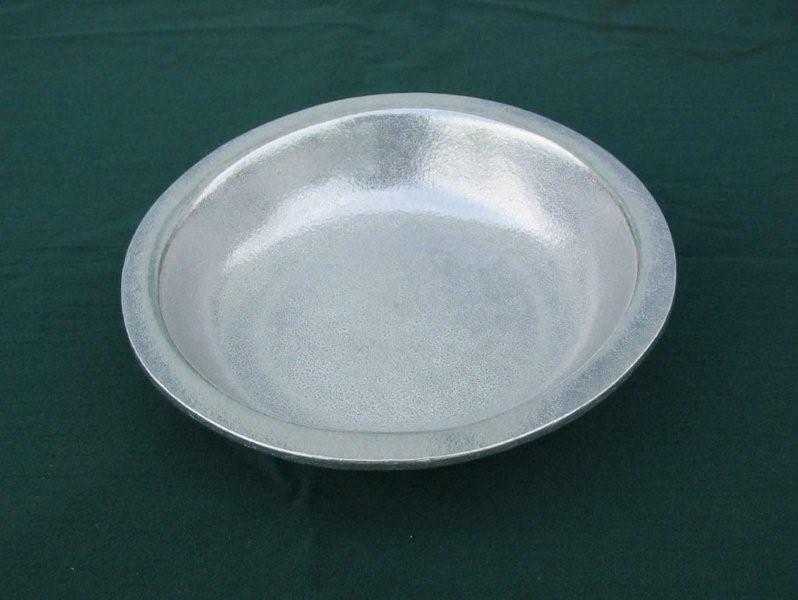 American made pewter, from one of the best makers in the country at a fraction of the new, retail price. 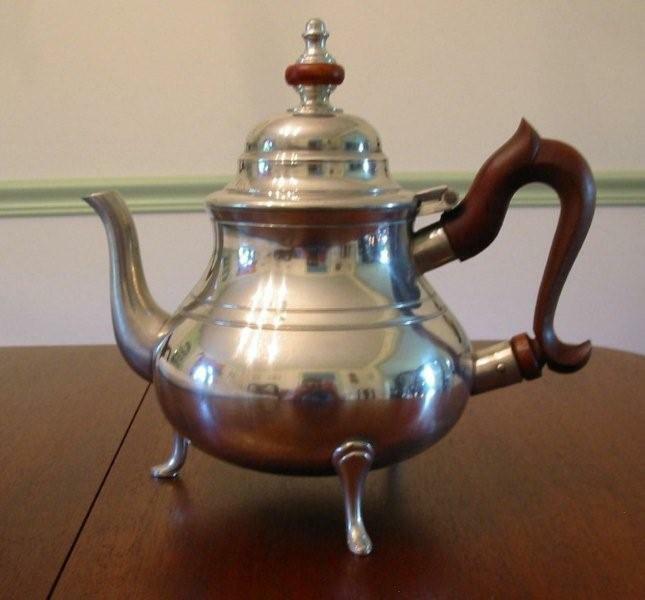 The following pewter items are all antique originals, dating from either the 18th century, or early 19th. All are at least 150 years old. 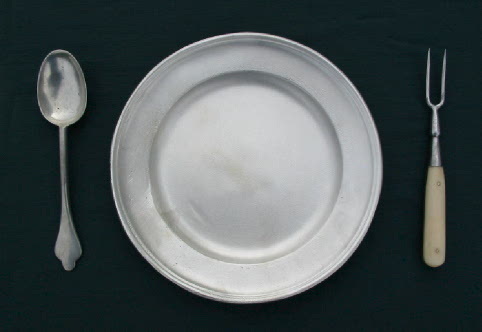 Many times the style of pewter from this period changed little over the decades, as often the same molds were employed for many years. 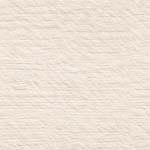 We attempt to describe these pieces as accurately as possible and when possible, give our opinion as to region of manufacture and date. 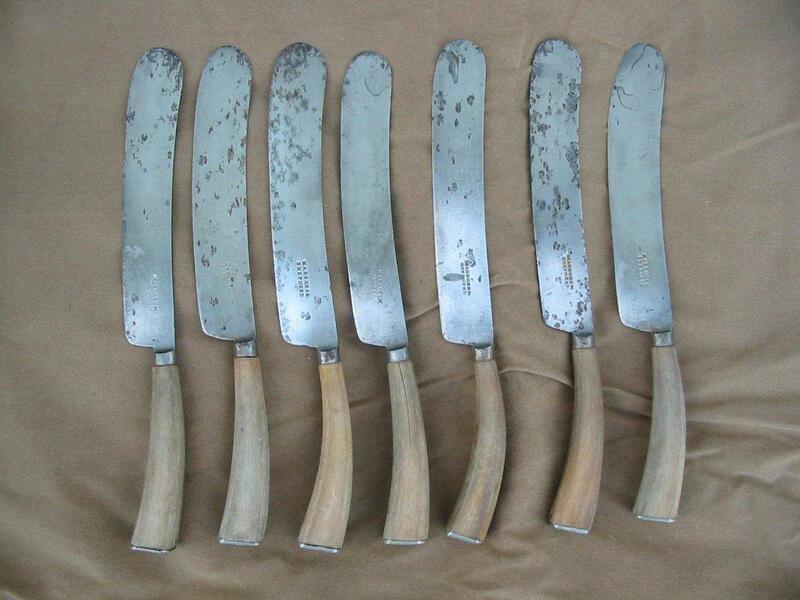 All have minor scratches and a nice patina consistent with their age. SOLD - Geddy Shop - Small Taper Candlesticks- Here is the rare opportunity to purchase work made in the restored James Geddy shop in Colonial Williamsburg. These candlesticks were made in the same manner as in the 18th century, hand cast, finished, and polished. 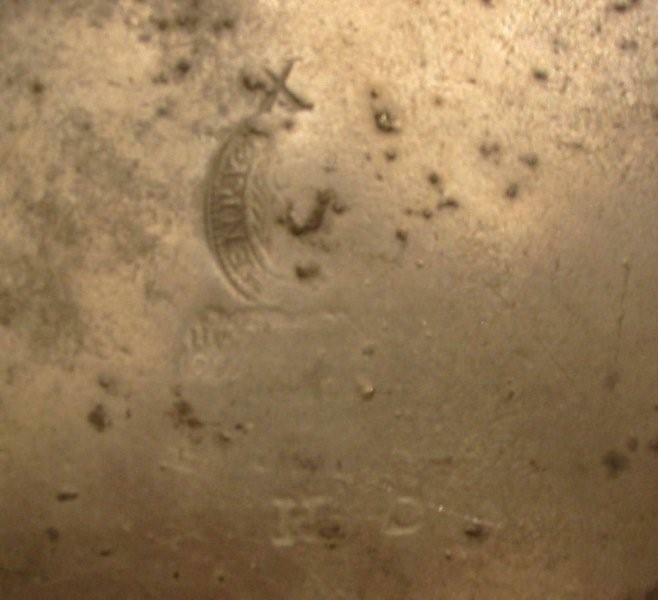 The underside is stamped with the touch mark of Sven Burg, master smith, as well as the "I.G." 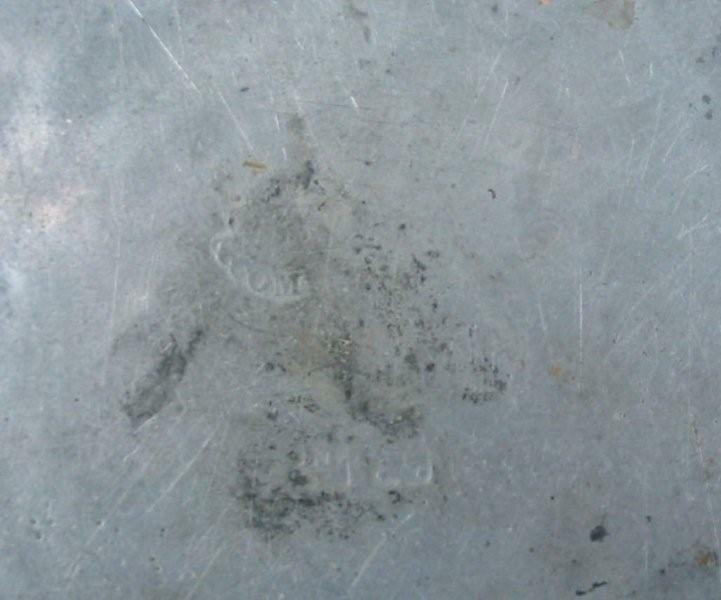 Geddy shop stamp and "Handwrought". 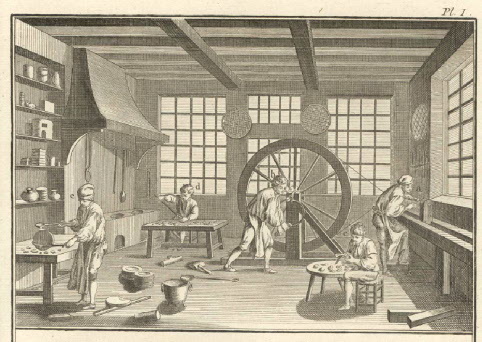 The candlesticks measure 4 1/2 inches tall and would have been used to hold a small candle for melting sealing wax. 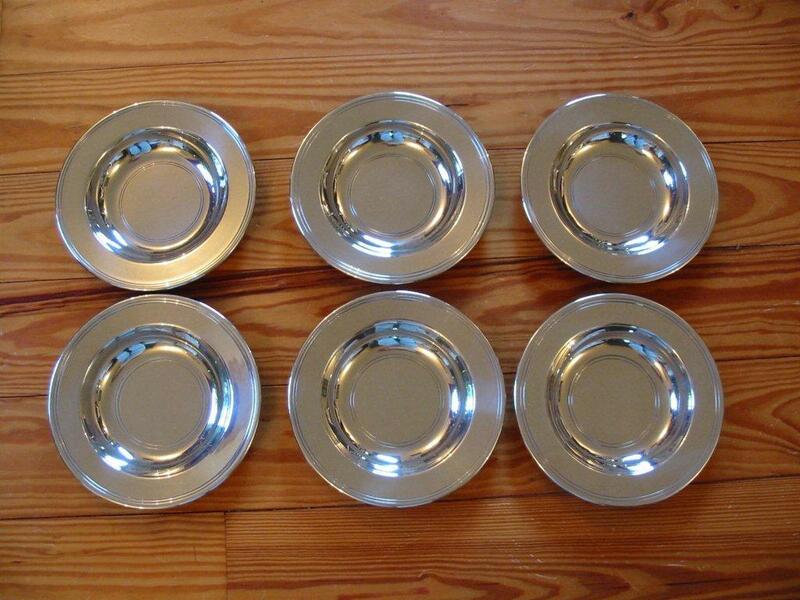 They have a nice mellow patina and are in excellent condition.